Now that you know how to build the gingerbread house, you need some great gingerbread house decorating ideas to make a beautiful, amazing house. These gingerbread house decorating tips come from years of practice, testing, and tasting of course! If you want to impress your guests this holiday season, display a beautiful, hand-crafted gingerbread house you make yourself. All you need are these fabulous gingerbread house decorating ideas and you can create stunning and delicious gingerbread creations all on your own. Use these gingerbread house decorating ideas to amaze your friends and family while letting your creativity show. After everyone is through enjoying the beauty of your creation, they all get to join in on finding out just how delicious they really are. Before you decorate your first gingerbread house, it's important that you plan properly first. Planning how and what you will decorate will help you greatly once you actually begin. If you search through these gingerbread house decorating ideas and decide ahead of time what you want, it will go much smoother. Of course, another method is to just buy whatever candy looks like fun and be creative. You just might end up with a more fun and less glamorous house. And there's nothing wrong with that! Your first decision is which parts of your house you want to decorate. For instance, you'll likely want to decorate the exterior roof and walls. You might want the chimney to be colorful and stand out, but what about the ground area? 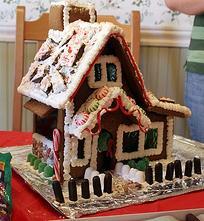 The gingerbread house will look much more inviting with the area surrounding the house decorated. When decorating the gingerbread house surrounding areas, or landscape, you can have grass or snow with a tree or some bushes scattered around to brighten things up. You can also add a fence post or lamp post to this area. If your house has a porch, think about what decorations will make this stand out from the rest of the house. After deciding what you want decorated on your gingerbread house, you'll want to decide how you want them decorated. This can be the really fun part because you are only limited by your imagination. Decide what items you will need for your gingerbread house decorating and make a list. This way you won't forget anything when you go to buy your ingredients. 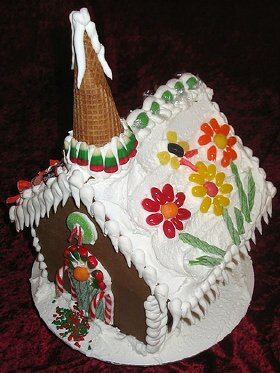 Professionals and/or perfectionists (and those competing in gingerbread house competitions) generally use edible clays such as fondant, gum paste, and marzipan to make detailed decorations. You can create magical scenes as detailed as a painted doll house with these clays, from wallpaper and tiled flooring to furniture, landscaping, and special roof tiles. Here's our starter page on the various edible clays. 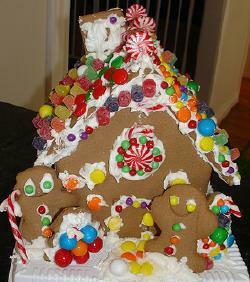 The best of our gingerbread house decorating ideas is to remember to keep the fun in the project. While patterns and recipes are helpful, you don't want them to stifle your own creativity. Don't be afraid to try a little something fun on your own. Crackers and cereal are also great for gingerbread house decorating. They can be used for the roof tops and designing the porch. Chewing gum also makes a great roof top. Candy canes can be used to support the roof of the porch or to make a lamp post. The chimney can be covered with M&M's, Fruity Pebbles or Red Hots to make it stand out from the rest of the gingerbread house. Powered sugar or coconut make a great snowy ground cover and ice cream cones can make a splendid pine tree. When decorating gingerbread houses, use food coloring to help give plain items some color to make them look more alive. Try green coconut for grass or colored marshmallows just for fun. Keep in mind that any area of the gingerbread house that's covered or overlapped by something else should be decorated first. For example, if you add a porch, the wall and entrance under the porch can be decorated before the porch is added, otherwise it might be really difficult to get to. Gingerbread house decorating is lots of fun. Don't be afraid to use your imagination and have a wonderful time decorating your house. If you know any gingerbread house decorating ideas you didn't see here, please share them with us. Want to share your own gingerbread house decorating ideas? We'd love to hear... and SEE your ideas!